May 31, 2018 – In late April and early May, the Dominican Sisters of Peace celebrated Panther Pride at Ohio Dominican University, Columbus, OH, and congratulated the Fearless Falcons of Albertus Magnus College, New Haven, CT, as the two institutions welcomed their 16th and 14th Presidents, respectively. 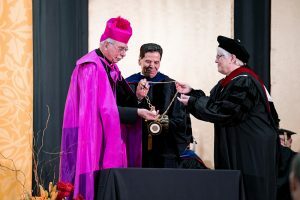 During the ceremony of Investiture, the Most Reverend Bishop Frederick F. Campbell, left, and Sr. Patricia Twohill, OP, Prioress of the Dominican Sisters of Peace, right, present new President Robert Gevasi with the Presidential medallion at Gervasi’s inauguration on April 27, 2018. Ohio Dominican University officially installed Dr. Robert A. Gervasi as the University’s 16th president at a ceremony on Friday, April 27, 2018, in Alumni Hall. The inauguration ceremony was the highlight of a weeklong celebration that included a lecture on Dominican Saint Catherine of Siena, an Inauguration Mass officiated by The Most Reverend Bishop Frederick F. Campbell, D.D., Ph.D., an all-campus celebration and reception, and an alumni reunion. Gervasi was introduced by Dr. Donna Carroll, president of Dominican University in River Forest, IL, a personal friend who also represented the Presidents of Dominican institutions across the country. “Those women who left Perry County’s green hills lived well this green secret a hundred years ago – that many small nostalgias of the heart cannot all be kept. That some must sometime go. 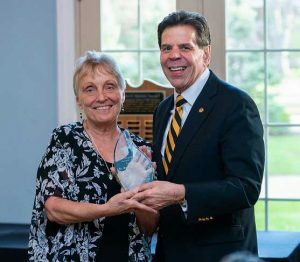 Sister Margie Davis, OP, is honored as a Distinguished Aluma at Ohio Dominican University on April 28, 2018, by University President Dr. Robert Gervasi. As a part of the weekend’s festivities, Sr. Margie Davis, OP, was honored as a distinguished alumna. Sister Margie, who received her degree from ODU in 1972, has served as the director of Campus Ministry at ODU since 2013. Ohio Dominican University was chartered in 1911 as the College of St. Mary of the Springs by the Dominican Sisters of Peace. Founded as an all-women’s school, the college became coeducational in 1964, changed its name to Ohio Dominican College in 1968, and became a university on July 1, 2002. 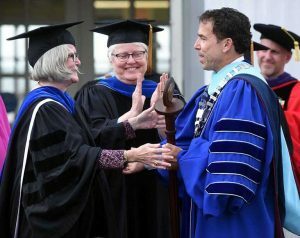 The Congregation also celebrated as Albertus Magnus College in New Haven, CT, inaugurated Dr. Marc M. Camille as its 14th president on May 4, 2018. The four-day inaugural celebration centered on the Dominican Pillars of Study, Prayer, Community, and Service. To celebrate study the community engaged in a Fearless Forum: “A Celebration of the Liberal Arts at Albertus.” The programming consisted of an evening of art, song and students and faculty presentations reflecting on courage. Jeanne Dennison, chairwoman of the Albertus Magnus College board of trustees, welcomes newly-inaugurated President Marc Camille, right, as Dominican Sisters of Peace Prioress Pat Twohill, OP, looks on during an installation ceremony at the college on May 4, 2018. To honor the pillar of prayer, the college community and guests participated in a Mass of the Holy Spirit celebrated by Rev. Brian Linnane, SJ, President of Loyola University, Baltimore, MD, at St. Joseph’s Church in New Haven, CT. The liturgy was followed by a reception. The Installation Ceremony itself demonstrated the pillar of community. Among the speakers were Archbishop Leonard P. Blair representing the Archdiocese of Hartford, Sr. Mary Eileen O’Brien, OP, President of Dominican College in Orangeburg, NY, representing the Dominican Colleges and Universities, Sr. Patricia Twohill representing the Dominican Sisters of Peace and Sr. Mary Catherine Hilkert, OP, who gave the keynote address, entitled, “Holy Curiosity: Pursuing Truth, Embracing Wisdom. The pillar of service was observed as more than 1,900 people donated their time in honor of the Inauguration. Participants received a commemorative t-shirt and those who did local service gathered for a community picnic at the college. In his inaugural remarks, Camille addressed the history of the college as, in the words of its first chaplain, “a movement toward the realization of distinct and substantial ideals… that education is the development of the entire being.” He addressed the college’s dedication to service, and the great charity and love identified by faculty, students and staff as the primary characteristic of the college and its community. In 1924, the Dominican Sisters of Peace purchased an estate in New Haven, CT, for a women’s college. The first classes at Albertus Magnus College were held on September 24, 1925. In 1985, Albertus Magnus College became co-educational and began taking steps to make life-long learning easier for working adults. In 1992, Albertus Magnus offered its first of its now eight graduate programs.